If you are regularly working on your Laptop computer then you would know its importance. A sudden breakdown in this all important device may mean disruption of all your work. Thus be it work, socializing or entertainment this all in one device requires utmost care. 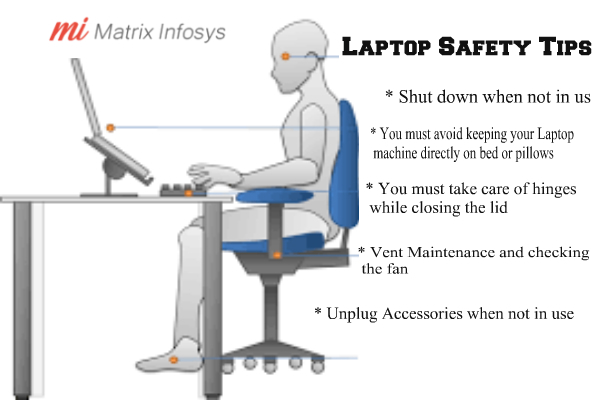 For us at Matrix Service , is a leading Laptop repairing service provider in Kolkata. We understand the importance of proper maintenance of your lap top computer. Our Laptop Repairing Service is one of our primary categories of services. In this blog we will try to make you aware of some simple Laptop maintenance tips you need to follow so that the all important computer device works smoothly without any problems. Laptop maintenance: What you need to know? In case of a desktop computer you can keep it running even if not in use. But in case of a laptop computer it should o be shut down when not in use. This important step prevents the laptop from overheating. After you must know that every device needs certain amount of rest. So make sure that you keep your Laptop computer when it is not being used. In case of most Laptop computers the vents are designed to be at the bottom or base of the machine. Thus you must avoid placing your laptop machine directly on the bed or pillows. Thus if you place the device on the bed there is a possibility that the vents would get blocked and it may get overheated causing much damage to your laptop computer. So must try avoiding this and at the same time and ensure that the vents are kept unblocked all the time for keeping the device cool as much as possible. The hinge is an important part of any laptop. It is this part which makes the lid open or close to make the laptop feel like a book. It may often happen that the passage between the hinges becomes clogged due to accumulation of dust particles. This may make the movement of hinges way to hard than expected. So you need to wipe these portions with a dry lint free cloth. If you feel that it’s taking more power than expected top open or close a laptop you should consider taking the help of a expert who can service the same. You must inspect the condition of the vents regularly and clean them whenever possible. You could use forced air dusters to keep the air vents clean and free from debris. Nothing should ever be pushed into the air vents. 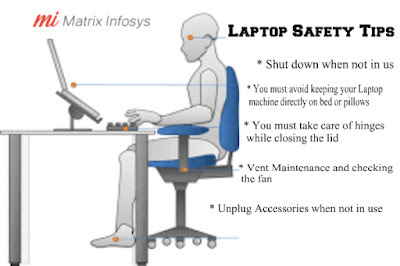 Apart from this you need to check whether the fan of the laptop computer is functioning properly. It is the fan which keeps the device cool and prevents any overheating. In case you notice there is a problem you must seek help from an expert in Laptop repairing. Remember always to unplug any accessories if not in use even if it be for shorter periods of time. This will prevent excess use power and also prevent laptop from getting overheated. It is most important to unplug any accessories before packing your laptop in its carrying case. In conclusion we hope that the topics provided above will indeed help in greater durability of your laptop computer. However in case you need any servicing or repairing of your device please get in touch with us and avail the best services. Thanks for post related to the laptop safety tips. Whenever, you face issues in your laptops then, get the technical support from the ET Solutions LLC as they provide support to end users.